Hoffenheim are set to protest against a freak goal awarded to Bayer Leverkusen when Stefan Kiessling headed the ball through a hole in the side of the net. Referee Felix Brych failed to spot that Kiessling’s header flew wide of the post in the 70th minute of Leverkusen’s 2-1 Bundesliga win on Friday. Hoffenheim managing director Alexander Rosen said: “It’s a scandal. Brych, a Fifa referee, said that no player had indicated it was not a goal. “I had a slight doubt but the reaction from the players was clear – nobody was against [the decision],” Brych said. In April 1994, Bayern Munich beat Nuremburg 2-1 after defender Thomas Helmer was awarded a goal despite the ball not going in. Nuremburg lodged a complaint, and Germany’s Football Association ordered a replay, which Bayern won 5-0 on their way to clinching the title. Hoffenheim coach Markus Gisdol said: “It’s definitely bitter for us and something like this has already happened once, and that game was replayed so I think we’re going to see this game again. Several Hoffenheim substitutes raced behind the goal to examine the netting and appeared to try to point out Brych’s error. But the referee was by then powerless to overrule his original decision. Leverkusen were leading through Sidney Sam’s 26th-minute opener when the controversy happened. Germany international Kiessling headed a corner wide of the near post, and could be seen turning away in frustration before Brych awarded the goal. The referee then awarded Hoffenheim a generous penalty when Roberto Firmino was fouled a foot outside the penalty area. But Firmino’s spot-kick was saved. Sven Schipplock pulled a goal back for Hoffenheim two minutes from the end, but they could not save a point and fell to their first home defeat of the season. 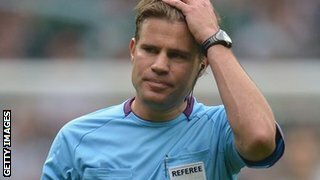 Brych, who refereed England’s 3-2 friendly win over Scotland at Wembley in August, sent off Manchester United captain Nemanja Vidic during a 2-0 Champions League defeat away to Romanian side Otelul Galati in October 2011. The win took Sami Hyypia’s side top, although Bayern Munich can overtake them by beating Mainz on Saturday.